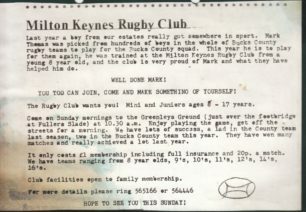 A selection of digital copies of press cuttings and memorabilia from the Milton Keynes Rugby Club’s album 04. This includes items from seasons 1983-84 and 1988-89. 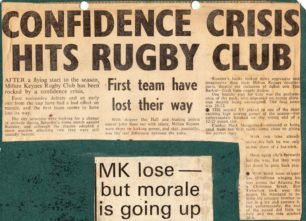 Two sports page articles (first one shown here) reporting that after four successive defeats there is a loss of confidence in the 1st XV. 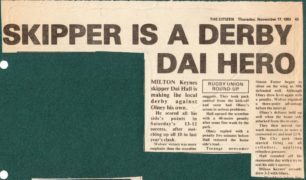 The second article reports on defeats of all teams by the Bicester club. 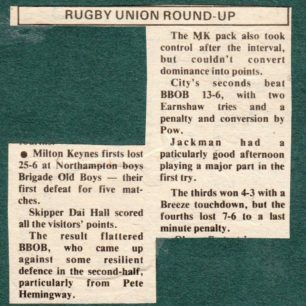 Rugby Roundup and two sports page articles reporting on match results against Northampton Boy Brigade Old Boys (BBOB). First article only shown here. Report that six junior MKRUFC players have been chosen for the county under 15 squad. The article also reports on success in matches against Coventrians. Two further reports on match results (not shown). Two sports page articles reporting on success in matches against Olney (one shown here). Two further articles reporting on the matches against Olney (one shown here, in two images). Rugby Roundups reporting on results of matches against Northampton Mens Own teams. 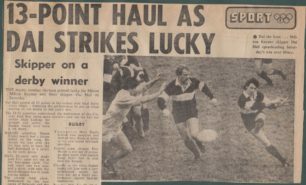 'Rugby Round Up';'MK firsts beat Coventry side'; Match photograph. 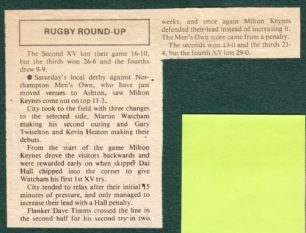 Three press articles report heavy defeat for the MKRUFC 1st XV in their match against Old Bosworthians; several replacement team members had to be brought in, including captain first article only shown here). 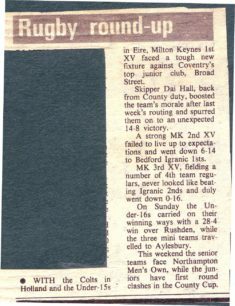 Press report that Dai Hall reurned from county dutiesthe previous week to orchestrate a ‘surprise win’ against Coventry Broad Street. 'From Pulpit to Second Row, Neville tries for conversions'. 'And On The Sixth Day He Played Rugby'. A further article with accompanying photo of Father Neville Kyrke-Smith. 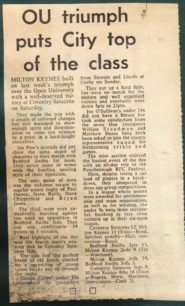 Carlsberg Trophy Match Programme 'An Open University Representative Team v Milton Keynes RUFC'. 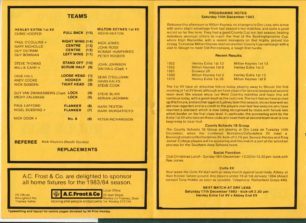 Programme for OU team match versus MKRUFC on 2 October 1983. Cover and inner pages with team and programme notes shown. OU triumph puts City top of the class'. 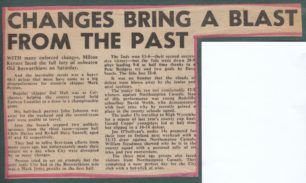 Three sports page articles on matches on 9 October 1983. ‘Triumph’ in match with the OU Representative XV is reported, together with MKRUFC victory against Coventry Saracens, under 15s at Corby and mini sections at Peterbrough. (First article only shown). 'OU given a lesson in 74-point feast'. MKRUFC leaflet to recruit juniors to sessions on Sunday mornings. 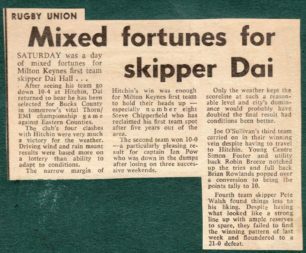 Three press reports on defeats in matches against St Neots (one shown). 'Scouts Skittle City'; 'Milton Keynes also hit by the weather'. 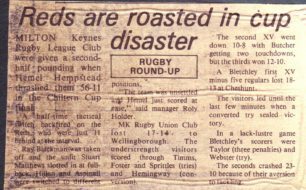 Three press cuttings (one only shown here) reporting on MKRUFC 2nd XV defeat by Northampton Old Scouts on a weekend of bad weather. Also a report that the Under 15 players are off to Spain. Report on win (17-7) over Abingdon match where young Andrew Swain was the star player (report shown); also report that Dutch Club Roosendaal visit to MKRUFC. 'City rattled by late penalty'; ' After Dutch visit MK back to routine'. 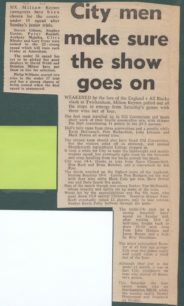 Three reports on draws with GEC Coventry (only one report shown here). 'With only two weekends left '; 'Reds are roasted in cup disaster'. Report that MKRUFC beaten by Hemel Hempstead 56-11 in the Chiltern Cup Final (shown here). Report that weakened MKRUFC players could only field three teams. 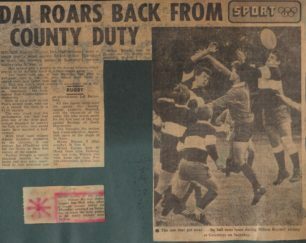 Item: 'Rugby Round Up';'MK firsts beat Coventry side'; Match photograph. 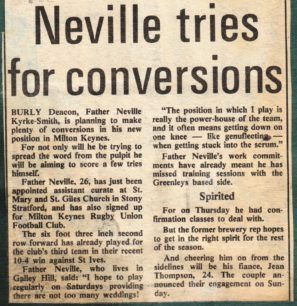 Item: 'From Pulpit to Second Row, Neville tries for conversions'. 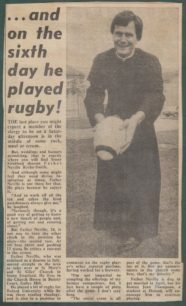 Item: 'And On The Sixth Day He Played Rugby'. 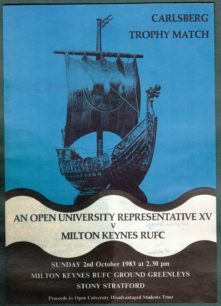 Item: Carlsberg Trophy Match Programme 'An Open University Representative Team v Milton Keynes RUFC'. Item: OU triumph puts City top of the class'. 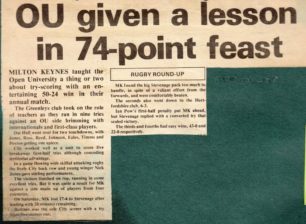 Item: 'OU given a lesson in 74-point feast'. Item: 'Scouts Skittle City'; 'Milton Keynes also hit by the weather'. Item: 'City rattled by late penalty'; ' After Dutch visit MK back to routine'. Item: 'With only two weekends left '; 'Reds are roasted in cup disaster'. Item: 'Milton Keynes Rugby Club can only muster 2 teams '; 'Game could be up for 'lucky' Rugby dog'. 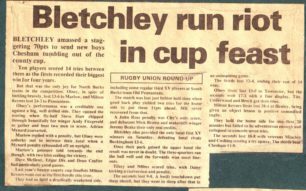 Item: 'Bletchley outgun their City Rivals'. Item: 'Bletchley make it a Clean Sweep'. Item: 'Casuals sink spirited City'. Item: ' Junior teams show the way'. Item: 'League boost for City'. 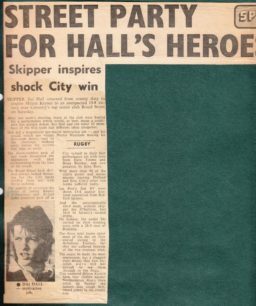 Item: 'City face a test of courage'; 'Fruitless but still useful'; 'Misery for Eales'.